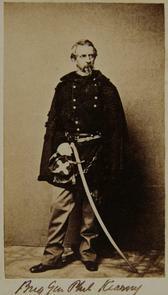 Full-length portrait photo depicts Kearney in full uniform, complete with cloak and saber. His missing left arm is not obvious under the cloak. Handwritten ID across the bottom: "Brig Gen Phil Kearny."